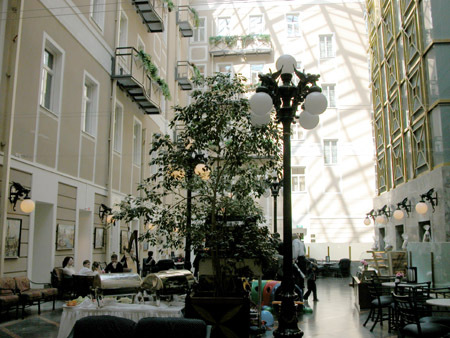 Today we will go over the most luxurious (as I guess) hotel of Saint-Petersburg-"Evropeyskaya". 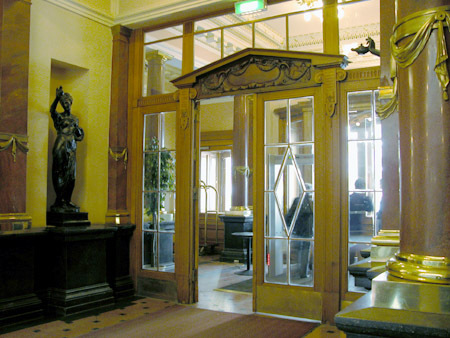 It is called now Grand Hotel Europe, it is owned by the group of stockholders and it is managed by "Kempinski Hotels & Resorts". It has its own history - it was built in 19th century by the famous architects. 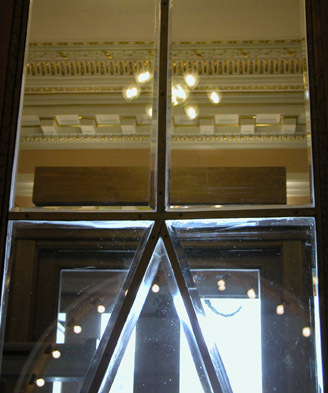 It concerns to the facades and to interiors too. 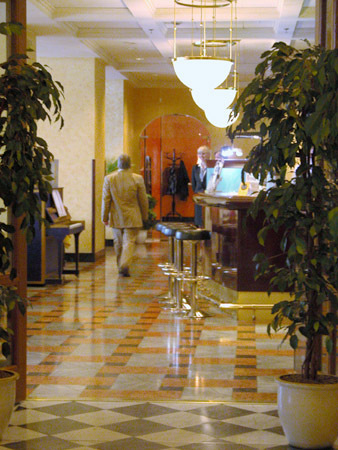 The Hotel is situated between Nevsky prospect and Iskusstv Square. The entrance from the Mikhailovskaya street. 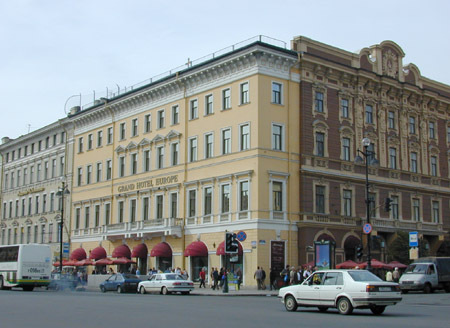 In 1824 the building facing Nevsky prospect was built, in 1825 - two buildings on Mikhailovskaya street, and also in five years they were connected by the same facade projected by K.Rossi. 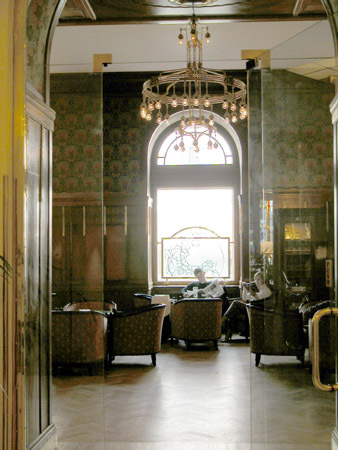 Then only one building - "Hotel of G.Klee" - was a hotel. 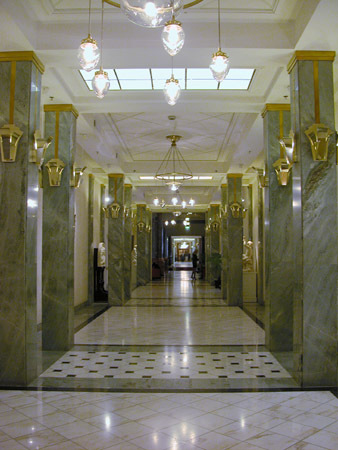 The second building was a A.Rogov`s profitable house, the third was used for small shops. 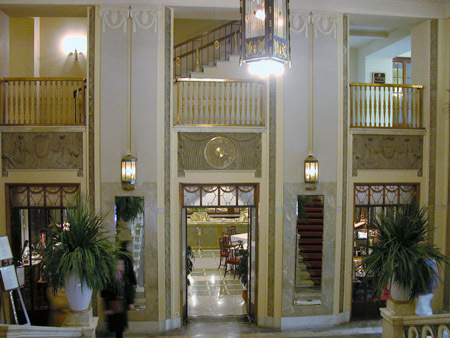 In 1870th after the reconstruction leaded by L.F.Fontana all the buildings were united, and the new hotel of 260 rooms was opened. Then were made four lifts - two for the tenants, one for the luggage and one for "rasing and lowering of food". 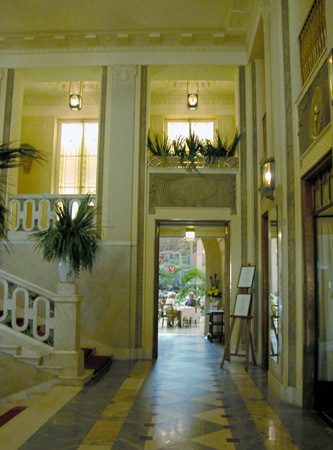 In 1905 the German architect Makenzen made the trimming of the main restaurant and the hotel premises. 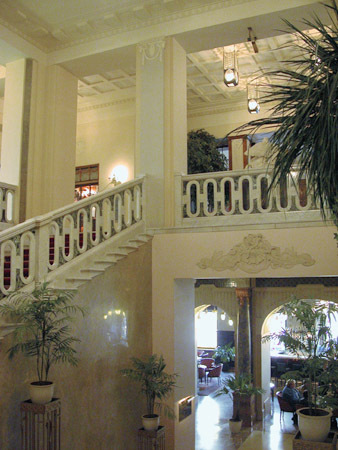 From 1908 to 1914 by the plan of F.I.Lidval were changed the interiors of the main stairs, hall, reading-room and the restaurant, also he build on dwelling unit - the mansard where the restaurant "Krysha" ("Roof") and a garden were created. After the Revolution (the Great October Socialist Revolution -1917) the hotel was renamed as "The House of Soviet Workers", but soon in 1918-1920 the shelter for homeless children was situated here. In the N.E.P. (new economic policy) times the hotel was again opened. 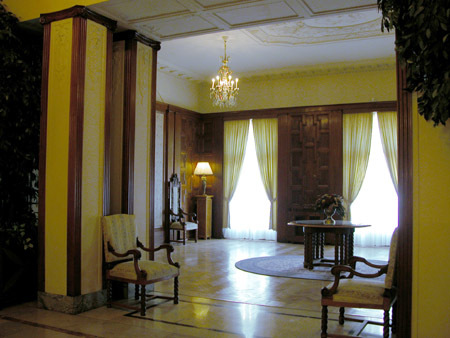 In 1932-1934 it was reconstructed for comparatively modest rooms for soviet workers. Then it was given to the "Intourist" agency. 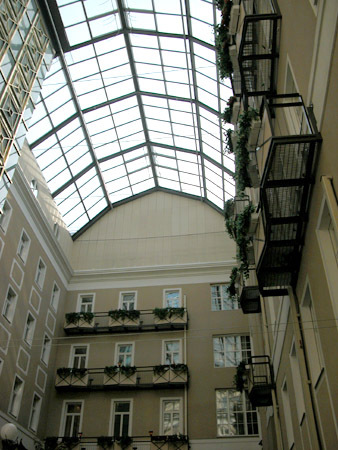 Till the war with Finland (1939) the headquarters of the Red Army was situated in the hotel. In the blockade (1942-1944) - it was a hospital for 1300 wounded. 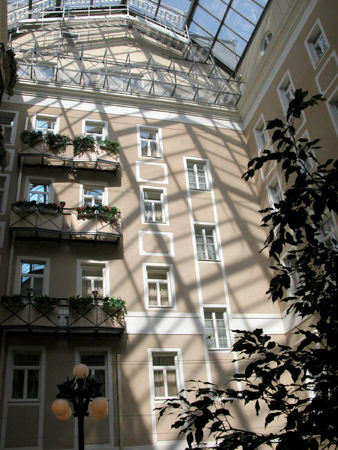 In the times of Great Patriotic War the shell hited the facade of the hotel facing Nevsky prospect. When they made a conclusion of reconstruction there was a question: what to reconctruction? The facade made by Fontana (eclecticism) or the classical facade created earlier by Karl Rossi which to restore the piece of Karl Rossi's project but to leave the last part of the building with facades of Fontana. 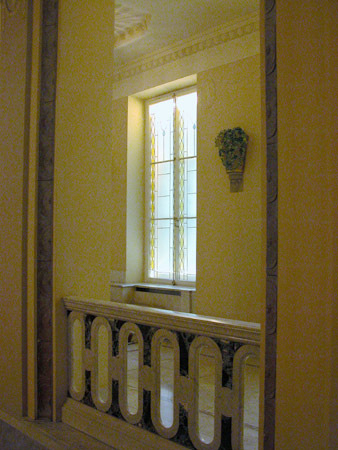 (on the picture - the front stairs on the second floor and a view to "Evropa"("Europe") restaurant). 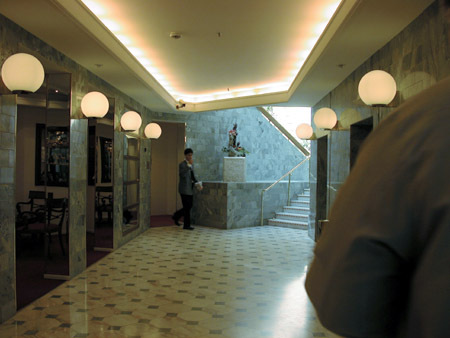 At the end of Reconstruction in Soviet Union in 1989, the hotel itself was closed for restoration. It was made by "Intourist" with Swedish firms "SIAB" and "RESO". 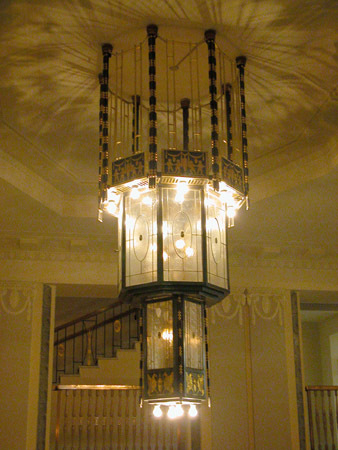 The project of architect B.E.Struzman. The whole cost of restoration - nearly $100 mln..
.The restoration was completed in 1991. 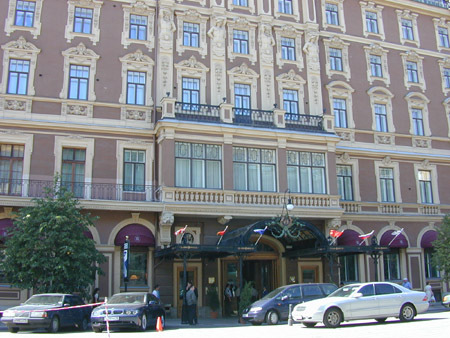 The hotel was renamed as Grand-Hotel "Evropa" ("Europe") and privatized. 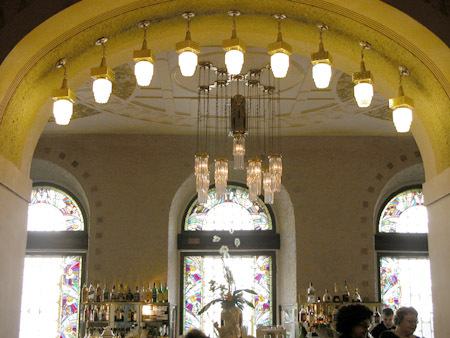 After the restoration it has 6 restaurants and bars, 300 rooms. By classification it is five-stars hotel. 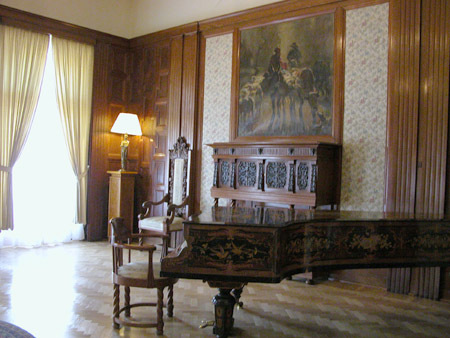 This work was estimated by the State Russian Reward. 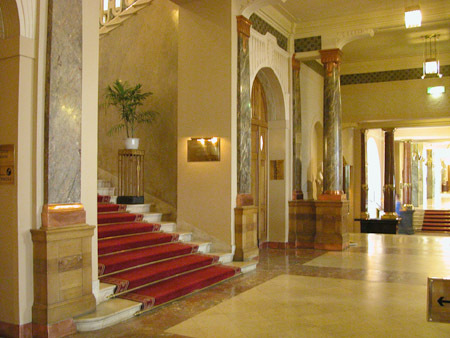 In the hotel lived various presidents, premiers, famous people. At the old times - I.S.Turgenev, P.I.Tchaikovsky, V.V.Mayakovsky, I.F.Stravinsky. At the last years - the Price of Wales Charles, presidents G.Shiraque, B.Klinton, ex-presidents of USA R.Nickson, J.Karter and also M.Rastropovich with G.Wishnewskaya, M.Pliseckaya, M.Kabalye. 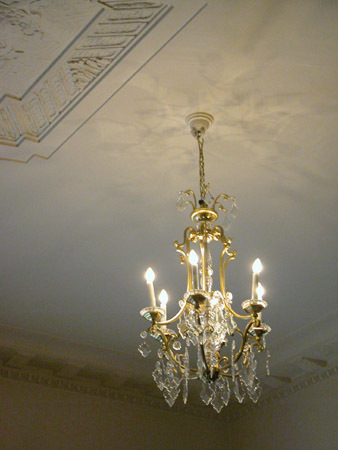 Some interiors and objects can easily rival with the palace luxury. 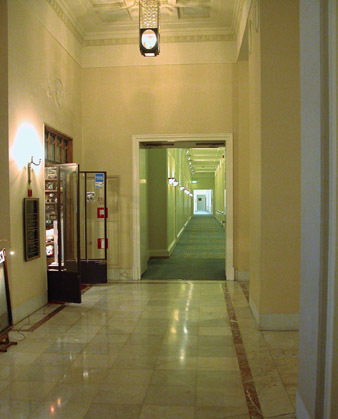 This modest corridor leads to the rooms. The way to closed inside yard - atrium. 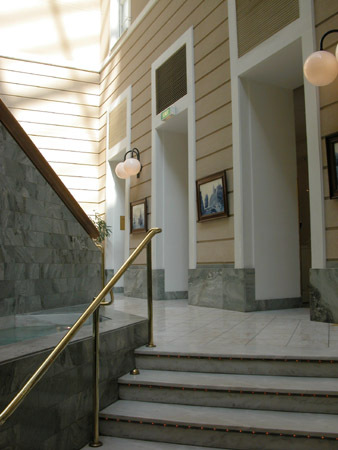 It is of course modern - the was no any atrium earlier. The yard is formed by several buildings. Below you can see tables with talking and reading people. They apply to "Mezonin". In the centre of the yard - such a temporary entertainment for kids. 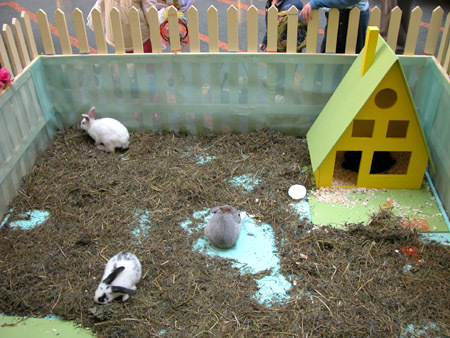 Temporary because in the west countries at that time celebrate Easter, and the rabbit is the symbol of this holiday.